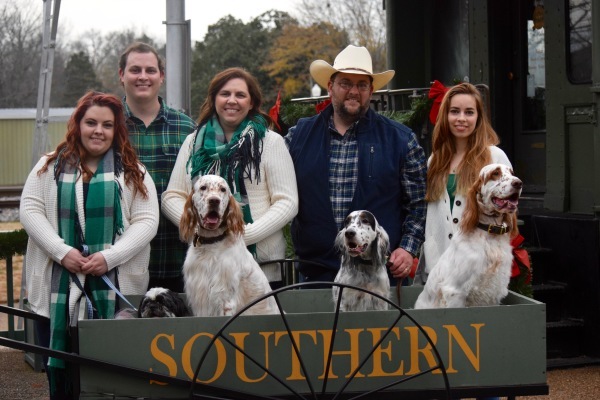 James and Pamela live in Collierville, TN just a short distance from Grand Junction, TN where The Bird Dog Foundation and the Field Trial Hall of Fame reside. This is also where the National Field Trial is run on the grounds of the Ames Plantation. We have grown up in this area where bird dogs abound. While the field trial dogs are usually very huge running, we were looking for a closer working dog. One that would do excellent for a foot hunter. The classic style of a true English Setter was something to behold and captivated us. James is an Aircraft Mechanic and loves to tinker and fix. He is an avid hunter and loves hunting deer, turkey, and of course birds. Working with the dogs has proven to be an amazing release after a stressful day at work! Pamela homeschooled our three children from kindergarten all the way through graduation. She has also always been amazing at antiquing and interior design. 4 years ago Pamela started her own business, Back Porch Birdie, Inc., an antiques and design business. The name of her business is homage to her late grandmother, Beatrice "Birdie" Spencer. Our three human children, Justin, Jessica, and Courtney are amazing. While they love the setters they have not been involved with any showing yet. We are still holding out hope that one of them will decide to bite the bullet and follow us into the ring or field.